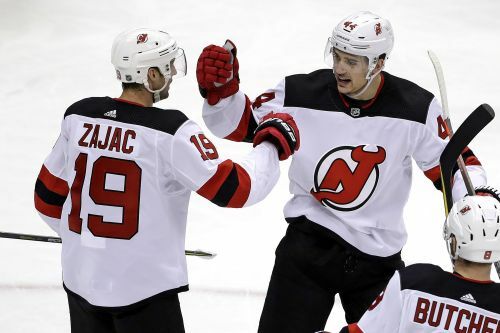 PITTSBURGH (AP) — Nothing has come easy this season for the New Jersey Devils. Except, that is, when they play the Pittsburgh Penguins. Then, the power play clicks. The penalty kill, too. The goals they've struggled to score all season come in bunches. Throw in Keith Kinkaid's steady play in net and the gear New Jersey has been unable to find much of the year suddenly reappears when Pittsburgh is on the other side of the ice. "It's just one of those things," Kinkaid said. "I guess we match up well against them. We always have our A game." Travis Zajac had a goal and three assists, Kinkaid made 37 saves and the Devils had little trouble in a 6-3 victory over Pittsburgh on Monday night to improve to 6-0-1 in their last seven meetings with the Penguins. New Jersey has drilled Pittsburgh in each of their three meetings this season, outscoring the Penguins 15-5 in the process. "Everyone looked fresh," Kinkaid said. "Everyone was moving. Everybody was flying out there and playing good defensively. The PK was solid, our special teams were solid. We just have to be consistent and that starts from me out to consistency the rest of the way." Pavel Zacha, Damon Severson, Brian Boyle, Blake Coleman and Kyle Palmieri also scored as New Jersey snapped a three-game skid. The NHL's worst road team improved to 6-17-3 away from home. Two of those wins have come at the expense of Pittsburgh, which has dropped four of five overall and looked a step slow following a nine-day break. Derick Brassard got his ninth goal for Pittsburgh before being ejected in the third period for elbowing. Matt Cullen and Bryan Rust added late goals after the game was decided. Matt Murray allowed six goals on 32 shots and the Penguins gave up their league-leading 11th short-handed goal of the season. "I think they've just outworked us, plain and simple," said Pittsburgh captain Sidney Crosby, held scoreless two days after winning the MVP award at the All-Star Game. "You look at the games, they've worked harder, they've deserved it. As disappointing as that is and as much as you don't like saying that, it's the truth." Pittsburgh limped into the All-Star break following a 2-3 West Coast trip, each loss coming in a game in which they surrendered at least five goals thanks in large part to sloppy play in front of the net. A chance to reset at home against a team well off the pace in the crowded Eastern Conference playoff picture didn't exactly go as planned. The Devils, like the Penguins coming off a week-plus layoff, showed more jump from the outset and it resulted in an early lead when Zajac took a feed from Steven Santini at the top of the left circle and fired a shot past a screened Murray 13:08 into the first period. Severson doubled the advantage less than two minutes later when he cruised uncontested through the neutral zone and beat Murray from high in the slot with a shot that nicked Murray's glove before settling into the net. Kinkaid withstood power-play opportunities by the Penguins to preserve the lead, and Boyle and Zacha's aggressive forecheck on the penalty kill set up Boyle's short-handed goal 3:30 into the second that put the Devils up 3-0. Penguins coach Mike Sullivan acknowledged it might be time to change things up on Pittsburgh's first power-play unit, a group that includes stars Crosby, Evgeni Malkin, Phil Kessel and Kris Letang. "They're all really good players," Sullivan said. "But we all have to take defensive responsibility when guys are in danger." Brassard responded less than 90 seconds later to get the Penguins back within two, but Coleman's rocket from the right circle 12:57 into the second restored the three-goal edge and the Devils cruised from there. Brassard's night ended 9:12 into the third period when he lined up Sami Vatanen along the end boards behind the New Jersey net. Vatanen tumbled to the ice and officials gave Brassard a five-minute major for boarding and a game misconduct. NOTES: The Devils went 2 for 5 on the power play. The Penguins were 0 for 5. ... New Jersey's six goals were the most the franchise has scored in Pittsburgh since Oct. 5, 2005. ... Zajac has four career four-point games. ... The Penguins scratched D Chad Ruhwedel. New Jersey scratched Ds Egor Yakovlev and Cory Schneider, and forward Kurtis Gabriel. ... Pittsburgh D Jack Johnson left in the third period and did not return. Devils: Face the rival New York Rangers for the first time this season at home on Thursday. Penguins: Host the NHL-leading Tampa Bay Lightning on Wednesday.